The Bureau of Quality Assurance and Improvement (BQAI) manages several critical components within the NH Department of Health and Human Services. Jill Fournier (photo above), a Lean Black Belt, a Quality Assurance Nurse has been with the Department of Health and Human Services for over 20 years. 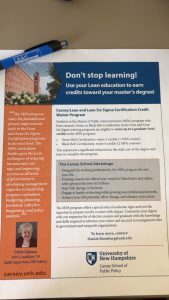 Jill has been offering “Lean learning bits” since her 2015 graduation of the Lean Black Belt from the NH Bureau of Education and Training. She began slowly introducing Lean principles to the BQAI in 2015 and now routinely provides training, mentoring, and coaching as her colleagues evolve with their skills. Edith Chiasson, Lean Black Belt, is a 2019 MPA Graduate Candidate for the UNH Carsey School of Public Policy Master of Public Administration program. She earned her Lean Black Belt certification through the State of New Hampshire’s Bureau of Education and Training in 2016 and is a member of the State of NH Lean Executive Committee. 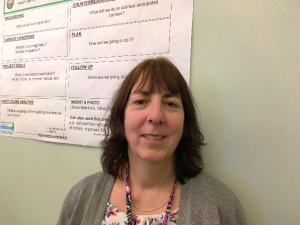 Edie is currently employed as the Audit Supervisor at the NH Lottery Commission and is using Lean approaches as a system of evaluating effectiveness and efficiency in current policy and procedures to uphold reasonable administrative costs to support and advance the agency’s mission. Edie has also provided leadership and Lean Coordinator support to initiate a pilot mentoring program, onboard newly trained facilitators, and more. For more on how Edie has integrated Lean into everyday work, contact her directly at Edith.Chiasson@lottery.nh.gov or 603-271-7151. Congratulations Edie on your upcoming academic achievement and for being a constant champion of continuous process improvement! The New Hampshire Department of Environmental Services (NHDES) is hosting an exciting Lean Week from April 1st – April 5th. In addition to these activities described below, we are holding a 5S contest, to see who can make his or her desk the cleanest, neatest and most organized. This winner of this contest gets a gift certification to Tucker’s Restaurant. Registration is now open for these informative and entertaining presentations The presentation titles provide a link to the registration information. Door prizes are available for attendees! 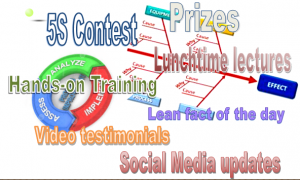 Contact Dan Hrobak, NHDES Lean Coordinator, to learn more and register for the 5S competition. Check out the NHDES Lean Webpage for more information about NHDES and Lean. 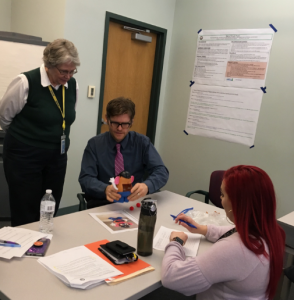 The Public-Sector Journey to Lean written by former New Hampshire Bureau of Education and Trainings (BET) professor, Kate McGovern offers a walk through the many contributions made to process improvement efforts. The book details vignettes and in-depth perspectives on the unique work of government. The book celebrates the accomplishments and challenges of New Hampshire’s Lean work. Kate’s book walks readers through the tough fight of muda (waste) in times of muri (overburden). 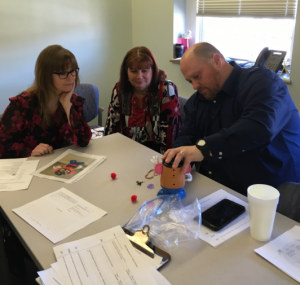 The story affirms the creativity and diligence of our Lean practitioners, documenting multiple countermeasures to muri, and the innovations on the New Hampshire approach. Heather Barto’s innovative Lean Wrap-Around Services Model for the Department of Health and Human Services is discussed, as well as the leadership provided in Department of Safety by Commissioner John Barthelmes, Colonel Chris Wagner, Roberta Witham and Sgt. Tom Lencki, and the camaraderie and commitment of those serving in the Lean Executive Committee (LEC). While crediting remarkable accomplishments of Lean practitioners, the book urges action by elected and administrative officials. A public policy parable is used to illustrate the challenges in New Hampshire, while Vermont’s program is described as an exemplar. The story closes with a series of recommendations designed to bring the initiative to the strategic level. The book is dedicated to Sam McKeeman who provided the hands-on Lean training model for the New Hampshire BET. Graduates of Sam’s training formed the core of New Hampshire’s movement for continuous improvement in public service, whereby there today much growth still happening. Kate will be providing a presentation and signing copies of “Public-Sector Journey to Lean” at BET’s Coffee & Conversation on Wednesday March 20, 2019. A 20% discount code is offered towards the purchase Public-Sector Journey to Lean. For more information on New Hampshire’s Lean efforts visit http://lean.nh.gov. Yellow Belt training is also available pre-conference on May 2-3 at a discounted price.